A Scarecrow can help you if you’re suffering from crows eating your crops. You can craft a Scarecrow even at the first level of Farming. However, you will not need scarecrows for crops that grow from Wild Seeds because crows prefer to ignore them. 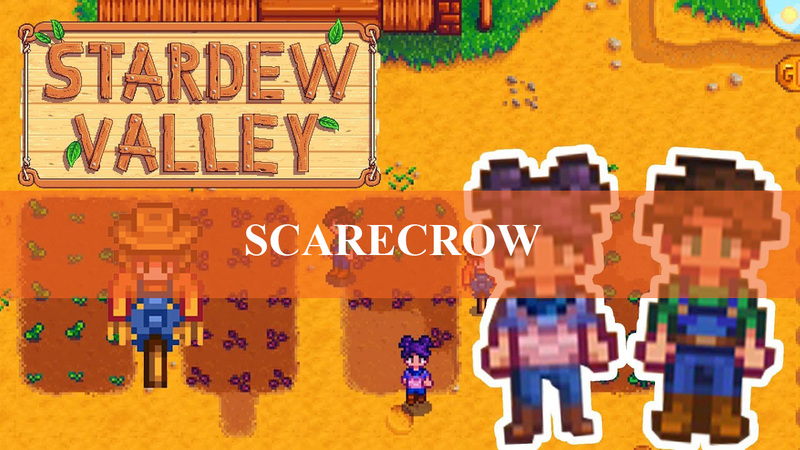 Stardew Valley Scarecrow range is circular, and it covers 248 spaces in total: eight spaces to the south, north, east, and west, along with six spaces to the southeast, southwest, northwest, and northeast. Along with regular scarecrows, there are also collectible Rarecrows that work the same way as the regular ones. However, the Alien Rarecrow is more functional, as you can use it to hang hats. It’s the only object in the game you can place hats on. The second Rarecrow can be purchased at the Spirit’s Eve. The third Rarecrow (the Alien) can be purchased at the Casino. The fourth Rarecrow can be purchased at the Traveling Cart in Winter or during Fall. The fifth Rarecrow can be purchased at the Flower Dance. The sixth Rarecrow can be purchased from the Dwarf. The seventh Rarecrow cannot be purchased. To get it, donate 20 Artifacts to the Museum. The eighth Rarecrow is a reward for donating 40 items to the Museum.